Get 40% in coupon. Buy "Roasted Soybeans 125g" and get a coupon worth £0.35. Get 20% discount in "Roasted Soybeans 125g" and save £0.17. Get 40% in coupon. 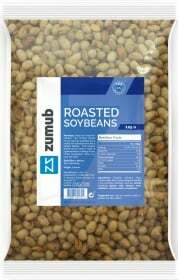 Buy "Roasted Soybeans 250g" and get a coupon worth £0.63. Get 20% discount in "Roasted Soybeans 250g" and save £0.31. Zumub Roasted Soybeans is a ready-made snack providing an impressive variety of nutrition-related benefits that allow for a more diverse diet. Either you decide to munch on them in between meals or add to salads and other dishes they will significantly improve the volume and quality of your calories intake. Feature one of the few complete plant-based protein - contains all the essential amino acids. That makes our soybeans a great option for vegans and vegetarians who lead a generally demanding lifestyles or want to build up muscle mass. Dense concentration of proteins. Apart from providing a complete amino acids profile, soybeans have more protein than many other major staple foods. In 100 g of soybeans you will find almost 40 g of protein. Good amount of carbohydrates, which again makes them an outstanding energy source for people of varied dietary preferences. Are abundant in dietary fiber – 14.3 g per 100 g - for better digestion and efficient hunger suppression. Have a good profile of vitamins and minerals, such as calcium, magnesium, potassium, vitamins from complex B, vitamin C and E.
In combination with Zumub’s great care and responsible attitude to manufacturing all these features of Zumub Roasted Soybeans make them an asset for health conscious individuals. Have a question about Roasted Soybeans? What is it, what does it do, how and when to use or something else? Ask us. “Roasted Soybeans 500g” is currently out of stock. Enter your details below and we will let you know when it's back in stock. ALLERGEN INFORMATION: Contains Soy.,May contain allergens handled in the production facilities, such as cereals containing gluten, milk, lactose, soy, nuts, sulphites, peanuts or sesame seeds. WARNINGS Roasted Soybeans : Keep out of reach of children. This product should not be used as a substitute for a varied and balanced diet & healthy lifestyle. This product should not be used in case of hypersensitivity or allergy to any of its constituents. Store in a cool, dry place. BEST BEFORE: Please see lot number and expiration date stamped on the packaging.